Due to a strike by major league umpires, the first four games of the NLCS were played with replacement umpires. Bob Dernier led off the game for the Cubs with a homer, and things went steadily downhill for the Padres as Chicago romped to a crushing 13–0 win in their first postseason game since 1945. Gary Matthews also homered in the first and added a three-run shot in Chicago's six-run fifth. Even starting pitcher Rick Sutcliffe went deep, while holding the hapless Padres to two hits over seven strong innings. The Cubs' overwhelming victory had Chicago's long-suffering fans dreaming of the franchise's first World Series championship since 1908. Chicago's offense was considerably more subdued in Game 2, though their pitching remained almost as strong. Dernier again opened the scoring for the Cubs in the first, singling to left and coming around to score on two groundouts. The Cubs got two more runs in the third, highlighted by Ron Cey's RBI double. San Diego got one back in the fourth when Tony Gwynn doubled and eventually scored on a sacrifice fly by Kevin McReynolds. But Chicago answered in the bottom of the fourth when Ryne Sandberg doubled in Dernier. San Diego cut the lead to 4-2 in the sixth on a run-scoring single by Steve Garvey, but the Padres could get no closer against the strong pitching of Steve Trout. Lee Smith came on with one out in the ninth to get the save, and the Cubs were just one victory away from the World Series. The series moved to San Diego, and the Padres staved off elimination with a convincing 7–1 win. During pregame ceremonies, the normally reserved Padres shortstop Garry Templeton encouraged the crowd by waving his cap. He ended a Cubs' rally in the first inning with an acrobatic catch of a line drive from Leon Durham. However, San Diego actually fell behind 1–0 in the second when Chicago's Keith Moreland doubled and came home on Cey's single to center. The Cubs threatened to score more that inning, but Templeton made another excellent play, diving to his right on a line drive from Dernier that appeared destined for left field. But the Cubs would get no more off Padres starter Ed Whitson, while San Diego's bats finally came to life with seven runs in the fifth and sixth. Garry Templeton knocked in two runs with a double in the fifth, giving San Diego their first lead of the series at 2–1. McReynolds essentially ended the game with a three-run homer in the sixth. Rich Gossage pitched a dominating ninth inning to wrap up the win for San Diego. Game 4 proved to be the most dramatic of the series, and it left many Cubs fans dreading another harsh disappointment for the franchise nicknamed the "lovable losers." The Padres jumped out to a 2–0 lead in the third on a sacrifice fly from Gwynn and a run-scoring double from Garvey. The Cubs actually took the lead in the fourth on a two-run homer by Jody Davis and a solo shot by Durham, who would later suffer ignominy in Game 5. The Padres tied the game in the fifth on another RBI from Garvey, and took the lead in the seventh when Garvey singled in yet another run. A passed ball allowed a second tally in the inning to make the score 5–3 San Diego. The Cubs bounced back in the eighth to tie the game on an RBI single by Moreland and an RBI double from Davis. With dominating closer Lee Smith on the mound for the Cubs in the bottom of the ninth, Gwynn singled to center with one out. Garvey then capped an extraordinary five-RBI game by launching a two-run walk-off home run to right center field at the 370 sign. During the game, the Padres lost McReynolds for the season after he broke his wrist trying to break up a double play. Durham hit a two-run homer in the first and Davis added a solo homer in the second to give the Cubs a 3–0 lead. Sutcliffe, who was 17–1 since joining Chicago in a mid-June trade, allowed just two infield hits through five innings. However, San Diego scored on two sacrifice flies in the sixth to cut the Cubs lead to 3–2. In the bottom of the seventh, Carmelo Martínez led off the inning with a walk on four pitches from Sutcliffe, and he was sacrificed to second by Garry Templeton. Martínez scored when pinch hitter Tim Flannery's sharp grounder went under Durham's glove and through his legs for an error. Alan Wiggins singled Flannery to second. Gwynn followed with a hard grounder at Sandberg's feet, which the second baseman expect to stay low, but instead bounced over his head into right center for a double; Flannery and Wiggins scored to give the Padres a 5–3 lead as Gwynn reached third. Garvey followed with an RBI single to stretch the lead to 6–3. Steve Trout then replaced Sutcliffe and got out of the inning unscathed. ↑ "1984 NLCS Game 1 - San Diego Padres vs. Chicago Cubs". Retrosheet. Retrieved September 13, 2009. ↑ "1984 NLCS Game 2 - San Diego Padres vs. Chicago Cubs". Retrosheet. Retrieved September 13, 2009. ↑ "1984 NLCS Game 3 - Chicago Cubs vs. San Diego Padres". Retrosheet. Retrieved September 13, 2009. ↑ "1984 NLCS Game 4 - Chicago Cubs vs. San Diego Padres". Retrosheet. Retrieved September 13, 2009. ↑ "1984 NLCS Game 5 - Chicago Cubs vs. San Diego Padres". Retrosheet. Retrieved September 13, 2009. 1 2 3 Cushman, Tom (October 5, 1984). "On this night, even fans came to play – 'Quiet Man' ignites spark to lift his team". Evening Tribune. p. F-1. Retrieved September 17, 2015 – via NewsBank.com. 1 2 Kravitz, Bob (October 5, 1984). "Templeton's bat, glove ignite Padres' fire". The San Diego Union. p. C-1. Retrieved September 17, 2015 – via NewsBank.com. 1 2 Johnson, Jay; Hughes, Joe (October 5, 1984). "Full house beats 9 Cubs". Evening Tribune. p. A-1. The scene was joyous pandemonium after the game, as long-suffering fans danced in the aisles, hugged total strangers, whooped and sang along as "Cub-Busters" played on the stadium's loudspeakers. 1 2 Staples, Billy; Herschlag, Rich (2007). Before the Glory: 20 Baseball Heroes Talk about Growing Up and Turning Hard Times Into Home Runs. HCI. p. 386. ISBN 978-0-7573-0626-6. Retrieved October 6, 2011. The home crowd had another weapon up its sleeve, a ditty called "Cub-busters", a parody of the theme from the Chicago-based 1984 hit movie Ghostbusters. ↑ Sauer, Mark (October 6, 1984). "With a toast from the host ... Padres' faithful primed for game 4 -- and maybe game 5". The San Diego Union. p. A-1. 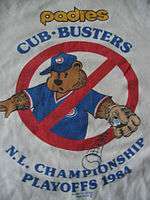 'The Cub Busters T-shirts have been the hottest item, but stuff we hadn't sold in years suddenly started moving,' said Croasdale. ↑ Laurence, Robert P. (October 2, 1984). "'Busters' promoter Cub at heart". The San Diego Union. p. B-1. Logan came up with the design after hearing the 'Ghostbusters' theme song at a Padres-Mets game in August, and his creation is without a doubt the hottest selling item in the Padres' inventory as excitement builds going into today's first game of the National League playoffs. 1 2 3 4 5 6 7 8 Wulf, Steve (October 15, 1984). "You've Got To Hand It To The Padres". Sports Illustrated. Archived from the original on September 3, 2015. ↑ Bloom, Barry (October 23, 1984). "Here's a chronological look at Padre highlights of 1984". Evening Tribune. p. D-3. 1 2 3 Anderson, Dave (October 8, 1984). "'Those Four To Martinez'". The New York Times. Archived from the original on September 3, 2015. ↑ Wallner, Peter J. (July 30, 2014). "Steve Garvey on facing '84 Tigers in World Series: They were a team of destiny". Mlive.com. Archived from the original on September 3, 2015.